Nigeria is a complex conundrum and for all the facets of life that come up for discussion it is easy to end up with a series of single stories which might skew the issues but they all add up to the narrative called Nigeria, its history, its problems, the solutions, the criticisms from nasty to constructive to the outlook to the future. One typical example of the jumbled narratives is the North, taken as a homogenous entity in terms of religion, ethnicity and economy for simplicity sake and packaged as such for media consumption but it has probably the most diverse and heterogeneous demography of Nigeria. Recently, I clamoured about  the fate of the Almajiri from the perspective of human and child rights, suggesting that certain controls and inspection regimes need to be put in place to arrest the unconscionable and despicable case of children and adolescents being in boarding schools of a certain persuasion but having to be beg for food. The more heart-rending aspect was the case of a boy ill with malaria and typhoid fever that was not in hospital and had not eaten since the night before; to suggest the head of that school was criminal and irresponsible would have been a heartless understatement – it is a pervasive problem. The Borno State Government has taken the first step towards addressing this problem by supporting 10,000 Tsangaya schools  to tackle the problems of feeding and to take the Almajiri off the streets thereby curtailing the begging menace. If government money is going into such institutions it should then translate into gaining control to regulate their activities, inspect their facilities and introduce a curriculum that will allow the Almajiri who in that setting will now be pupils and students to learn a trade or some vocational skill along with their religious schooling. If successful, one will hope that this concept will spread out to other states pulling Tsangaya schools into a structured educational regime that upholds child rights preparing them for viable and productive careers. 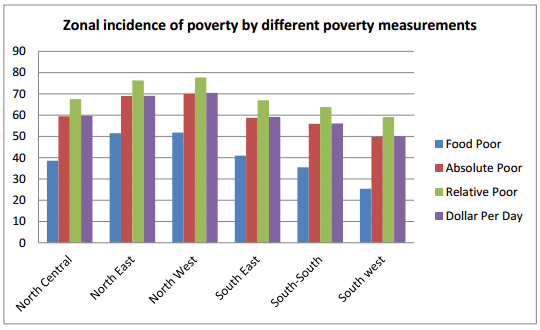 In the Nigeria Poverty Profile released by the National Bureau of Statistics, we are presented with the stark detail that relative poverty has increased between 2004 and 2010 with the North-Central, North-Eastern and North-Western zones revealing increasing levels of poverty compared to the three zones in the South. The Northern Governors then thought to redress this imbalance by demanding a review of the revenue allocation  from the centre; this threatens to draw a dangerous fault-line giving credence to that age-old North-South divide that has become the basis for analysing problems in Nigeria. Looking at the numbers, there probably is a case for a review but the problems are more fundamental than that. The Niger Delta oil-producing area probably has the highest per-capita allocation but the governors have not been judicious in the use of the funds for the development of their states. Most of the communities are poor, their lands polluted, infrastructure lacking and the travesty gave rise first to activism and then militancy without much improvement towards tackling the environmental disasters or the future prospects of the masses. Likewise, governorship in the North has not taken up the responsibility to create enabling environments and offer the essential impetus for development that can pull their people up from abject poverty and it is unlikely that throwing more money at the region with yield the results required but that is a subject for negotiation and debate between all affected parties. The demand however called for cool and wise heads to comment from the Presidency. Until recently on matters of security, power or policy, the President has been handed speeches that has left a good many readers and listeners in despair, complete forlorn as to where the country might be going that clueless had become the description of President Goodluck Jonathan’s grasp of issues. One can only suppose the President had sacked his uninspiring speechwriter and acquired one that could capture the mood and set out a range of opinions that make sense and give people, especially the governors a sense of responsibility and purpose, though we still have to wait and see what comes of it. However, in response to this demand, the President in a speech recently given  on a visit to Makurdi had this to say. "We have resources in all parts of the country to sell. All states of the federation have products they can export. The governors should work with private sector operators to produce and sell what they have not only to Nigerians but also to export." "Nigeria is an agro-based economy even before the civil war and that is why they did not borrow money to prosecute the war. We should be able to revive this process like it happened in those periods when oil was not an issue." "If we create the enabling environment and liaise with the private sector, people will not need to steal or go into 419 before they can make it." In other words, state governors should work better at realising potential in their states and seek to exploit such as if there were no oil revenues to rely on. The national cake is no more big enough to go round effectively, the states that to generate more income internally by doing the best with the resources they have and seek markets for their goods for their states to prosper. One interesting element of history that we seem to forget about Nigeria that the President alluded to in his speech is that Nigeria might well be that only country in the world to have prosecuted a civil war without running into debt, it harks back to a can-do spirit of fiscal prudence that Nigeria apparently once had, which means it can be rediscovered again. In all, all governors have serious work to do having escaped the fury of the people during the #OccupyNigeria protests and deep scrutiny of their policies until after their tenures the President has laid down the modalities on which governance accountability will be based, this should be the first of many to get them to sit up and start delivering solutions to their people. The powers of the governors should be curbed (ie with regard to the taking out external loans in foreign currency), and the governors and their deputies should be held account and regularly reviewed, if they are failing they should be removed. To think not one state can supply constant drinking water to it's people, or deal with sewage in a satisfactory manner, speaks volumes to what Nigerians hold as a priority. People are too busy fussing over trivia, rather than concentrating on the less exciting basics of any modern society.